We also strive to keep the area safe to live in. And represent the interests of the community in it's relationship with the local authorities. You can contact us at: . Tel: 021 683 8523 - James Fernie (Chairman). P O Box 2627, Clareinch, 7740. 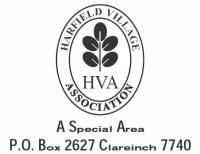 Or find our FACEBOOK group by searching "Harfield Village Association". CITY OF CAPE TOWN CONTACT CENTRE - C3 The City of Cape Town has a central contact point for queries and complaints, eg broken street lights, or non-service from council departments. They will provide you with a tracking number, and feed back to you as your query/complaint is attended to. You can contact them by phone: 0860 103 089 or SMS (with no more than 160 characters): 31363 or Email: . "> .